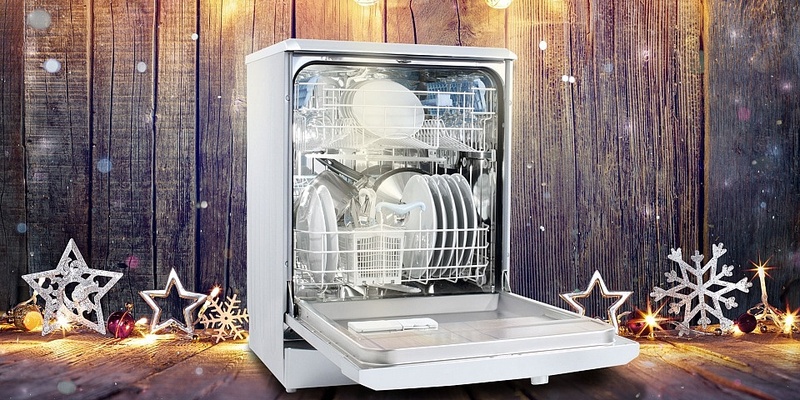 Get clever with your dishwasher this Christmas to avoid getting stuck with stacks of filthy washing-up. Step one: start by making sure you’re prepared: doing as much food prep as you can in advance means you’ll reduce the amount of washing up you’ll need to do come Christmas diner. Step two: do an intensive load of your most dirty cooking dishes before you sit down to eat. This gets rid of your roasting tray, pans and prepping knives (if they’re dishwasher safe). Step three: Scrape posh dinner plates, then combine with cutlery and glassware in a delicate load after dinner – and depending on your dishwasher, you can add champagne flutes into this wash too. 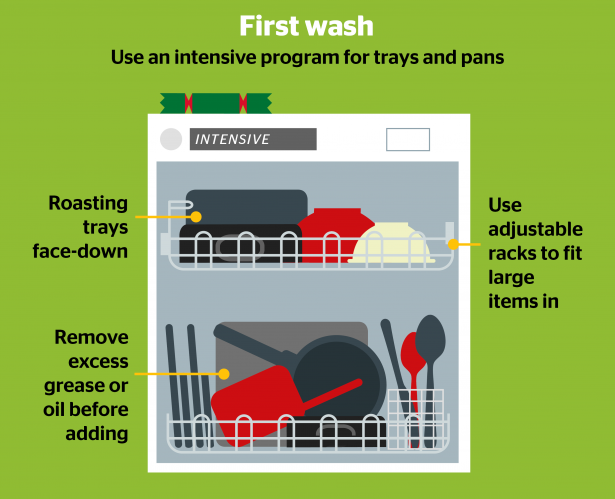 Read on for how to stack to squeeze everything in and still get it clean, plus our Christmas dishwashing tips. Or head to our dishwasher reviews to find out which models are best for the mammoth task. Remove excess grease and oil or it could solidify and end up blocking the filters or drains. Collect any excess and dispose of in your regular food waste bin. Place roasting trays face down to give your dishwasher the best chance of cleaning away baked-on food. Some dishwashers will even have a separate larger spray-head for heavy-duty jobs like this. Use adjustable racks for taller items. Check your instruction manual to see whether your dishwasher has an upper rack that can be lowered or raised. Others use a runner system that requires the basket to be removed and the runners to be adjusted. If you don’t have a quiet dishwasher and need to eat in the kitchen while it’s on, hopefully all that cracker pulling and Christmas fun you’ll be having will drown out the din of the wash cycle. If not, it might be time to invest in a dishwasher that doesn’t make so much noise. We check this for every dishwasher we review. Find out those that are quietest and also great at cleaning and drying by scrolling our round up of the best dishwashers. After Christmas dinner its the turn of all your dinnerware. This means all your plates, bowls, cutlery, serving spoons, gravy jugs, glasses and even champagne flutes and wine glasses. Be careful not to overload your machine. Leaving spaces between dishes and cutlery allows the water and detergent to spread around. You could even try alternating between larger and smaller plates next to each other to help this. Consider using a tall gravy jug, rather than a short and wide one, as it will take up less space in the dishwasher. If you’re using china with delicate gilding, you may not want to run this through the dishwasher. Even in a delicate wash, these decorations can fade or react badly. Prep vegetables on Christmas Eve and par boil the spuds for your roast potatoes. You can even get them crisped up early on Christmas morning and avoid needing to clean a crusty pan later in the day if you follow our roast potato recipe. Run your dishwasher early in the day, so it’ll be empty of any breakfast plates and ready to take all the cooking pans and trays. If you have a delay timer, set it so your dishwasher finishes your pre-dinner wash just before you plate up. That way your plates will be pristine clean and hot, straight out of the dishwasher, so your Christmas dinner stays warm for longer. Wash champagne flutes in the top rack, using a gentle program. You might worry that this will cause them to go cloudy over time, but modern dishwashers and detergents prevent this from happening, even in hard water areas. As they’ll come out dry, too, you won’t have to worry about carefully drying them with a tea towel once you’ve had a few sherries, or leaving them precariously drying on your drainer. 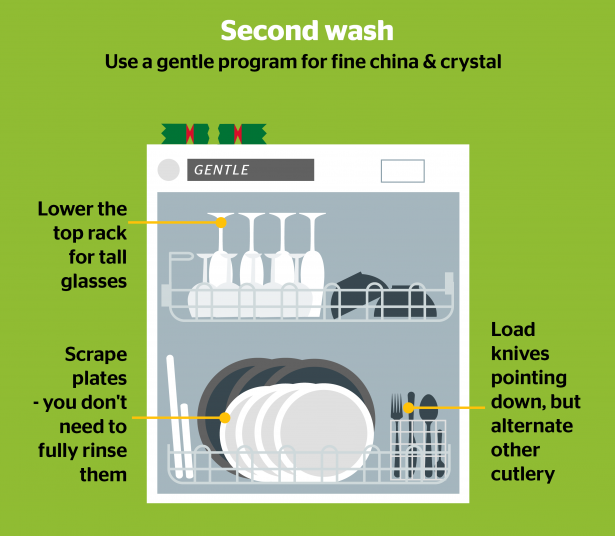 If your dishwasher doesn’t have a delicate or glassware program, we’d recommend leaving out your crystal and china, and washing those by hand. Most dishwashers now have a quick rinse at the start of each program. This means you only need to knock off lumps of leftover food before loading. If you’ve left your dishes sitting around all day before washing, you will need to give them a rinse before putting in the dishwasher for the best chance of getting everything clean. It’s safer to load your knives pointing down, but forks and spoons can alternate between up and down. This should help to reduce the chance of items sitting too closely together, leading to them not being cleaned properly. This issue is known as nesting, and can happen with cutlery baskets or racks where spoons (for example) nestle into each other. Which dishwashers will help you survive Christmas?